This past Christmas I bought my daughter a mermaid tail blanket. She can hardly leave anywhere without it. She loves sleeping in it and wearing it around the house, pretending to be a mermaid. 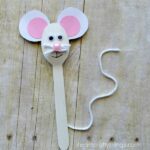 I knew with her love of mermaids she would adore this wooden spoon mermaid craft. Now she has some little mermaid friends to play pretend with and put on fun puppet shows for me. 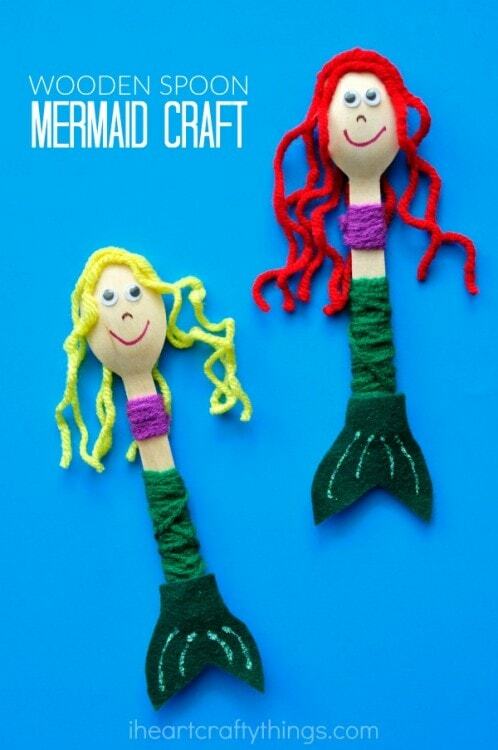 If you have mermaid fans at your house, they are going to love this simple mermaid craft too! 1. 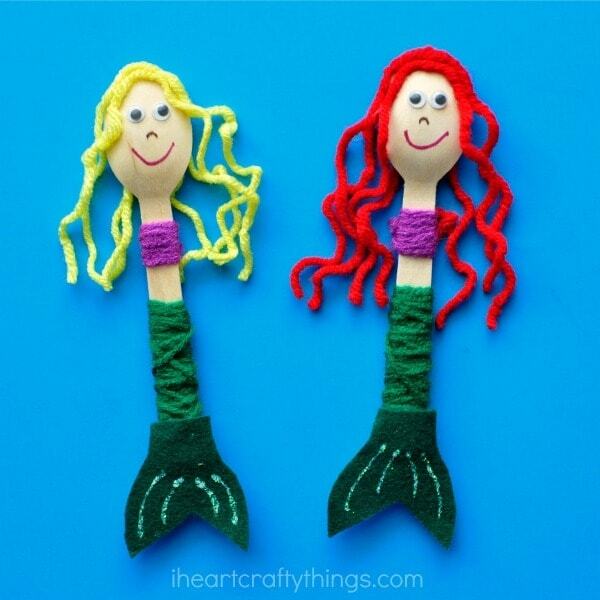 Start by wrapping purple yarn around your spoon to make the mermaid shell top. Tie a knot in the back and cut off any excess yarn. 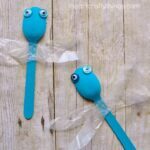 Now wrap green yarn around the bottom of the spoon for the mermaid tail. When you get to the end tie a knot and cut off any excess. 2. 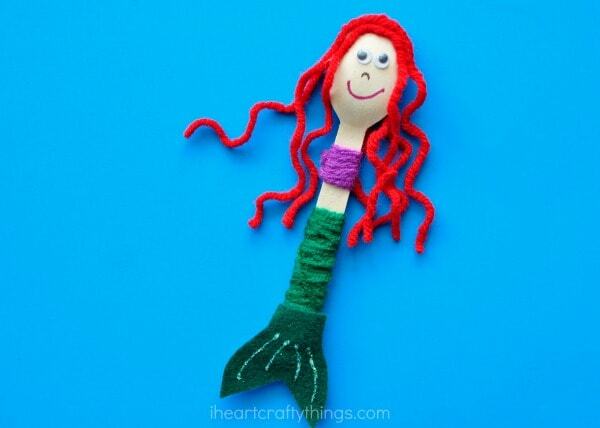 Cut off several strands of your red yarn (or color of your choice) and use tacky glue to glue it to the top of the spoon and some on the back of the spoon for mermaid hair. 3. 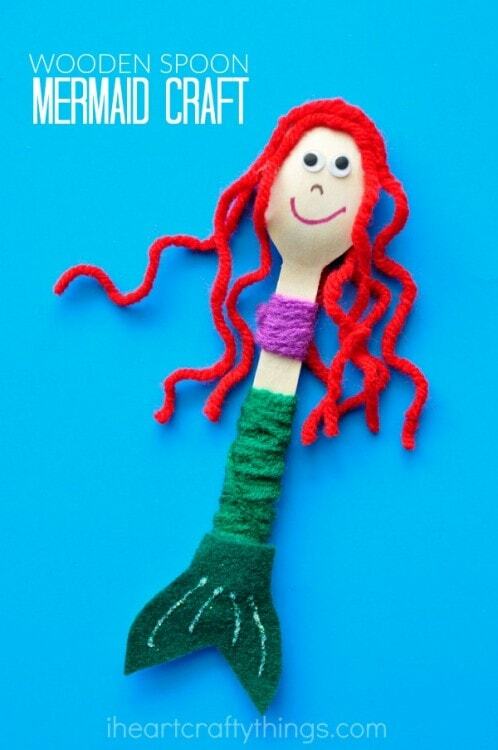 Cut mermaid tail fins out of your green felt and glue them onto your green yarn to finish the mermaid tail. 4. 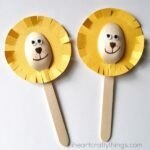 Glue on your googly eyes and use markers to draw on a mouth and smile.5. Finish your mermaid craft by using glitter glue to make some glittery highlights on your mermaid tail fins.